Located in the heart of the CBD at 373 Flinders St, next to City Lane. The innovative Townsville City Campus has been designed to deliver a diverse range of facilities and services for the university, business and community organisations. The nearly 1000 square metre, three storey campus is used for a variety of purposes. Boasting a range of innovative, flexible study, learning and teaching, meeting and informal gathering spaces. It includes a Collaborative Learning Area, which features the latest technology and design to promote flexible learning and innovation. It features the first “moot court” in North Queensland with e-court facilities. It allows JCU to provide practical training to its law students in the latest methods of evidence management. The campus includes a boardroom with video conferencing and catering facilities, allowing JCU to engage directly with business and the local community. The facilities can be used to host seminars and functions. Business groups and other external community organisations are able to hire the facilities. The CBD campus can host short courses for businesses seeking staff professional development. The campus features extremely high speed internet. Students are welcome to drop in and use the facility for study, and can bring their own devices or use the computers available in the Student Spaces on level's 2 and 3. A printer is also located on level 3 for student use. The Welcome Lounge is located on the ground floor and is coordinated by the Client Service Officers. The team can provide advice and assistance on a range of student enquiries, including applying to JCU, course and subject advice, admissions and re-admissions, enrolment help, fees and financial information, student loans, examinations, timetables, scholarship information, support services, graduation, as well as information about the Townsville City Campus facilities and access requirements. You can take a virtual tour of some of these facilities or ask about hiring them. 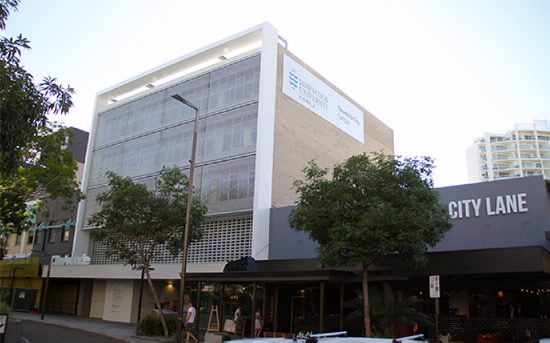 Read the Important Information about the Townsville City Campus before placing an enquiry. Outside of the City Arcade opening hours, access is only available from the Level 1 car park via Sturt Street, beside the Australia Post. The Welcome Lounge is open and staff are available: Monday – Friday from 9am-5pm. For enquiries about the City Campus call 07 4781 4040. For all other student service enquiries or JCU enquiries call 07 4781 5255 or free call (within Australia) 1800 246 446.